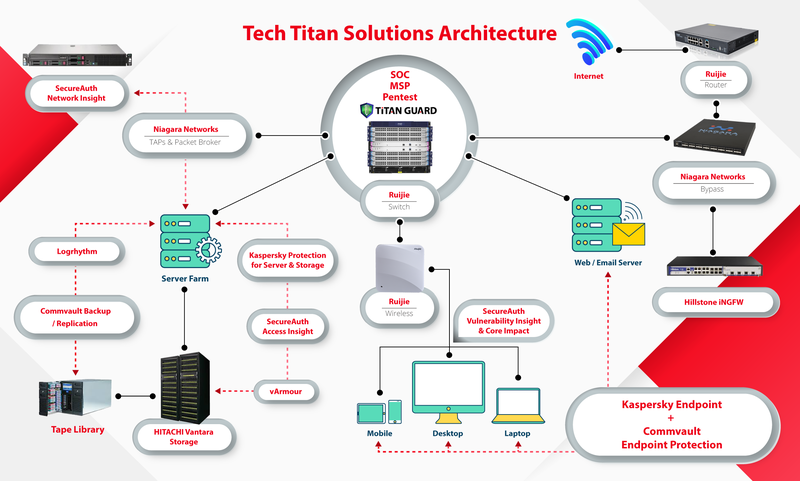 TECH TITAN Group is the 1 Stop NEXT Gen IT solutions and Services Provider that always drive innovative solutions towards Digital Transformation and provides leading IT solutions. We lead the industry to embrace emerging technologies – helping to redefine the future of technology readiness. Our Success today derives from the Trust of the partners & users that we have built via the Dedication, Commitment & Support we continuously strive to deliver to our partners and users over the past 10 years. Over 1 million cyber-attacks happen every day. SecureAuth’s analytics-driven approach to security and remediation enables customers to manage access and identify vulnerabilities to minimize risks and maintain continuous compliance. SecureAuth’s enables enterprises to take a more comprehensive and predictive approach to safeguarding critical data and assets. Arista Networks is a leader in building scalable, high-performance and ultra-low latency cloud networks with low power consumption and a small footprint for modern data center and cloud computing environments. Purpose-built hardware with Arista 7000 family and Arista EOS, maximize system uptime, stateful fault repair, Advanced Event Management, Zero Touch Provisioning, latency analysis and a fully accessible Linux shell. Arista’s Ethernet switching solutions include native support for VMware, network-virtualization and hundreds of applications. Arista’s hardware platforms are designed to meet the stringent power and cooling requirements of today’s most demanding data centers, proven advantages already in use in many of the largest cloud data centers around the world. LogRhythm’s Threat Lifecycle Management Platform provides a complete, end-to-end workflow so you can sort through the noise and quickly discover, investigate, and respond to cyberthreats. Our range of security solutions offers the combination of security & manageability that’s right for your business. Niagara Networks helps Service Providers and Enterprise Data Centers implement the most advanced visibility, monitoring and security solutions whether 1G or 100G. Niagara Networks’ product family is the result of sophisticated systems architecture and advanced product designs developed and produced by Interface Masters Technologies, a leading Silicon Valley Network Solutions provider to OEM customers from market leaders to cutting edge new companies. Now an independent company, Niagara leads the industry with deployments of 100G security solutions today, and in the future 400G and beyond. Traditional network and device cybersecurity approaches do not work for high-value apps running in untrusted environments. Without additional protection, applications are your least secured attack vector. With RedSeal’s network modeling and risk scoring platform, you’re able to understand the state of your network, measure digital resilience, verify compliance, and accelerate incident investigation. RedSeal determines your RedSeal Digital Resilience Score(TM), a network cyber risk score modeled after a creditworthiness score, so you can accurately measure how prepared you are now and actively manage progress toward where you want to be. RedSeal is the essential network modeling and risk scoring platform that puts decision-making power right in your hands. vArmour, the data center and cloud security company, delivers agentless integrated security services to auto-discover application communications, optimize policy modeling, and protect critical applications and workloads across multi-clouds. The vArmour DSS Distributed Security System is deployed across the world’s largest banks, telecom service providers, government agencies, healthcare providers, and retailers. Partnering with companies including AWS, Cisco, HPE and VMware, vArmour builds security into modern infrastructures with a simple and scalable approach that drives unparalleled agility and operational efficiency. Netsweeper application is designed to manage the Internet access and activity of Internet users around the world. Originally created as an alternative to the limited performance of the early filtering products that simply used word-blocking techniques and URL-blocking lists, Netsweeper was designed with the first automated and on demand content filtering categorization system. Netsweeper is the first Internet content filtering company to develop and use a form of hybrid “AI” (Artificial Intelligence) technology to scan content, assign content to categories, and update its filter system without human intervention in real-time. Group-IB’s security ecosystem provides comprehensive protection for your IT infrastructure based on our unique cyber intelligence, in-depth attack analysis, and effective incident response. We provide a wide range of services designed to test whether your staff and partners are ready a real-world attack. With security assessment, proactive DDoS, and penetration testing, you can be certain that you are protected from any vulnerability. Starlight leverages patent pending Distributed Security Intelligence™ technology to deliver massively scalable, pervasive breach detection. Using sophisticated correlation of enriched data and advanced artificial intelligence techniques, Starlight is able to detect breach events faster than humans and with higher fidelity. This unique approach helps companies reduce the time to detect a breach from an industry average 200 days down to mere minutes. Zimperium solutions, collectively known as the zPlatform, allow customers to detect and prevent more mobile threats, with the least amount of organizational friction, than any alternative. Zimperium’s on-device, machine learning-based detection of mobile threats and enterprise-class capabilities are unmatched. 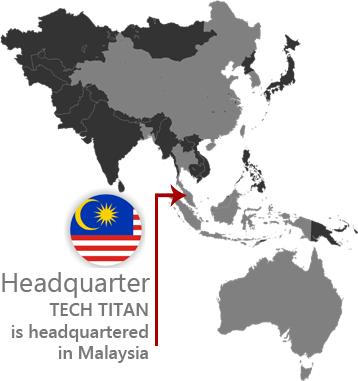 TECH TITAN is headquartered in Malaysia with regional offices distributed in Indonesia, Thailand and Malaysia which cover businesses within Southeast Asia region. It currently has staff strength of 400 which provides professional expertise to deliver the satisfactory of products and services to exceed customers’ expectation.